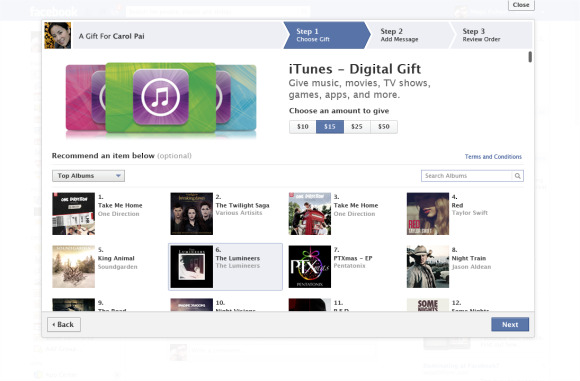 Facebook is making it even easier to send the gift of iTunes this holiday season by adding iTunes digital gift cards to Facebook Gifts, prompting cheers from last-minute shoppers across the U.S. The new Gifts addition allows you to send your friends iTunes credits worth $10, $15, $25 or $50 for purchases on Apple's digital content bazaar. Facebook Gifts' iTunes addition only lets you send dollar amounts that your friends then credit to their own iTunes accounts. If you had a specific gift idea in mind, you can also recommend that your friend use the credits for specific music, movies, TV shows, apps and other content. Ultimately, however, the recipient gets to choose how to use your iTunes gift. Facebook in recent weeks has been steadily ramping up its Gifts service for the holiday season. The social network in September introduced the ability to send your Facebook friends gifts such as Starbucks cards and GUND teddy bears. In November, the company added a number of popular retailers and brands to Giftsincluding Brookstone, Baby Gap and Lindt Chocolate. The company is hoping its new Gifts service won't just be about sending presents during the holidays, but that Facebook users will get in the gift-giving spirit for other occasions such as anniversaries and birthdays. One part of the new Gifts service is that birthday reminders on Facebook now include a link to send your friend a gift using the new Facebook feature. Facebook Gifts is currently available only to users in the U.S.